Global physiotherapy devices market expected to generate revenue of around USD 2749.4 million by end of 2024, growing at a CAGR of around 6.5% between 2018 and 2024. Physiotherapy is a physical treatment provided to people and patients to build up, restore, maintain and continue the maximum movement, flexibility and functioning ability during their lifespan. The report covers forecast and analysis for the physiotherapy devices market on a global and regional level. The study provides historical data from 2015 to 2017 along with a forecast from 2018 to 2024 based on revenue (USD Million). The study includes drivers and restraints for the physiotherapy devices market along with the impact they have on the demand over the forecast period. Additionally, the report includes the study of opportunities available in the physiotherapy devices market on a global level. In order to give the users of this report a comprehensive view of the physiotherapy devices market, we have included competitive landscape and analysis of Porter’s Five Forces model for the market. The study encompasses a market attractiveness analysis, wherein product type and technology segments are benchmarked based on their market size, growth rate, and general attractiveness. The study provides a decisive view of the physiotherapy devices market by segmenting the market based on product, applications, end-users, and regions. All the segments have been analyzed based on present and the future trends and the market is estimated from 2018 to 2024. The global physiotherapy devices market is classified by product, application, end-users, and by region. Based on the product, the physiotherapy devices market is categorized into equipment and accessories. The equipment segment is further sub-segmented into hydrotherapy, electrotherapy, heat therapy, cryotherapy, ultrasound, continuous passive motion (CPM), laser therapy, and others. The accessories segment is bifurcated into orthoses and assistive devices in the global physiotherapy devices market. On the basis of applications the physiotherapy devices market is classified into musculoskeletal, neurology, cardiovascular, and other. Based on end-user, the market is classified into hospitals, physiotherapy clinic, rehabilitation center, and others. The regional segmentation includes the current and forecast demand for North America, Europe, Asia Pacific, Latin America, and the Middle East & Africa with its further categorization into major countries. This segmentation includes demand for physiotherapy devices market based on individual product, application, and end-user in all the regions and countries. 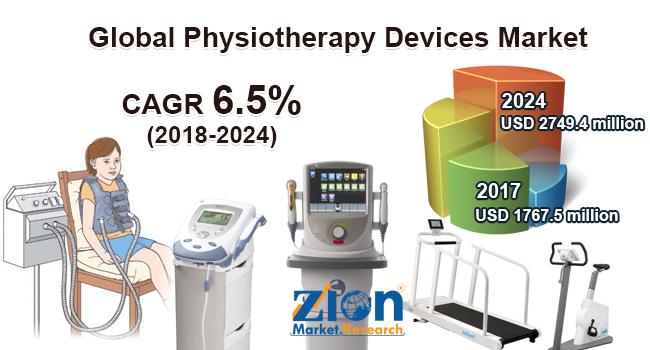 Some of the key players in the physiotherapy devices market include Patterson Medical, Zynex Medical Inc., BTL Industries, Dynatronics Corporation, Life Care Systems, A. Alego Limited, DJO Global, EMS Physio Ltd., Enraf-Nonius, HMS Medicals Systems, and others.